With the holidays fast approaching and more invitations to get together with friends and family, it got me thinking about what to bring to the next gathering, or just to serve when they come to visit! Here are two, deliciously fast, cheap and easy ideas! The first one I came across because I always seem to have extra frosting after decorating a cake. I didn’t want to throw it away! (That is not an acceptable option!) So I decided to take out some mini Vanilla Wafers I had in the pantry, squirt frosting in the middle and sandwich that between two of the cookies. Once you have them put together you can roll the edges in sprinkles or mini chocolate chips, or dip them in melted chocolate! You could do this with whatever cracker/cookie you have on hand, graham crackers are also very tasty! I also seem to have random boxes of instant pudding at home. This can be an ingredient in a fancy, but cheap, dessert. It’s a spin off of the traditional trifle. Mix up the pudding as directed. Use any cup or fancy/plain clear-glass dish and put a thin layer of pudding on the bottom. Then, alternate pudding and crushed up cookies until your dish is full to the desired serving size. 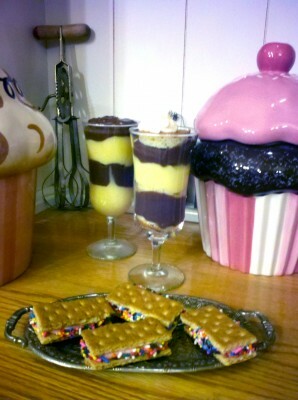 You can use just about anything as a layer in your trifle – the sky is the limit! Whipped cream (cool whip) is also really good with pudding. Or, you could use two different kinds of pudding. Fresh fruit would also work if you chose to create layers of pudding and fruit, or even Jello and fruit. A thin layer of chocolate syrup would be a delightful option! One box of pudding usually makes 4 medium sized individual glass desserts! This of course depends on what size containers you have on hand. This is a great individual dessert that is easy to make and fun to eat! YUMMMM…..love these! They sure sound (and look!) so good! I ♥ the recipes and ideas on here. They are awesome!